Recently, as I was following through on my New Year's resolution to get organized, I bought a bookcase to help me get started. As I was gathering all of my books from every place in the house I could possibly have stored them in the past, I found one of my Georgia O' Keefe art books. She is one of my most favorite artists. 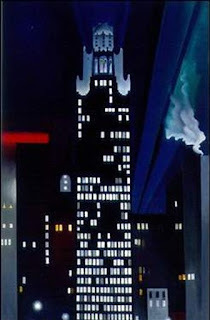 Her painting of the Radiator Building in New York is one that I really love. I have taken drawing classes and her ability to even get all of those windows straight alone earns my respect!